No, I’m not about to offer a free ebook. I’m announcing today that at So Much More Life, I won’t talk about ebooks anymore. I won’t be writing any ebooks, and I won’t be promoting the ebooks of any other bloggers. I think the age of the blogger ebook is over. This post isn’t about Kindles or the future of publishing. It’s about the ebooks that bloggers write for various purposes and promote on their blogs. A question should immediately spring to the mind of my regular readers: Has he ever promoted an ebook? Actually, yes. I won’t mention which ones since that would promoting them, I suppose, but I will explain why ebooks have a very limited place in my simple, deliberate life. I’m admittedly a bit concerned about offending some of my best blogging friends. Many of them have written ebooks in the past, and at least three of my favorites have written ebooks very recently or plan to release one soon. Today’s announcement, however, is for them just as much as it is for you. Today’s announcement is for them because it explains why I haven’t written an article promoting their ebooks. There’s nothing wrong with their books. In fact, some of the blogger ebooks I’ve read are great. But they don’t have a place in my life, and I won’t give any ebooks a place on this site. It’s not a personal slight against anyone. I just don’t write about ebooks, and I don’t buy them. Today’s announcement is also for the rest of you because I owe all of my readers an explanation about why this blog is so much different than the others. I don’t have as much money as even the simplest lifestyle requires, so the additional income an ebook affiliate sale might bring would help me. In fact, I’ve mentioned four ebooks on this site in the past, and I sold at least one copy of each and got an affiliate payment from the writer. If I wrote my own book, at least a few of you would buy a copy, wouldn’t you? But is it worth hijacking my own blog to promote a product to the same people I encourage not to spend their money in wasteful ways? I can live with having ads on this site, but I can’t live with writing copy intended to sell ebooks. Text and image ads have been a part of this site from the beginning, and I make no apologies for them despite my cautious approach to media. I’m not interested in further confusing the message of this site, however, by telling you to buy something you really don’t need. Some ebooks are free, so the bloggers who offer free ebooks can’t be accused of diluting their message by trying to sell you something. Still, you’ll have to take the time to read what they say if you get their ebooks. Like watching television, listening to music and reading romance novels, reading ebooks is a great way to waste away a life that could be occupied with creating, doing and experiencing the world. Bloggers who suggest getting rid of your TV believe you are addicted to it, wasting your time watching things you don’t want to see. You could also be addicted to Internet surfing, blog reading, wine tasting or witch hunting if you do it just to occupy the long hours of a meaningless life. Ebooks are an addiction too. I know people — real people that I see in person — who have empty lives they must fill with ebooks, email and iPods because they have nothing important to do. I don’t want you to become one of them. I’ve been accused of being a drama queen before, and maybe I’m taking a melodramatic and irrational view of ebooks. The number of people actually harmed by them must be negligible. That doesn’t matter, though. Ebooks have no place in my simple, deliberate life. They never really did, come to think of it. I’ve read a few ebooks — just like I’ve watched a few episodes of TV’s Bloopers and Practical Jokes. I’m not proud of either, but these things were once part of my life. Everything positive and negative that I’ve said about ebooks in the past (and I’ve mentioned the negative side of ebooks before) will remain here on So Much More Life, but I won’t say much else about ebooks. Except this: Read my words understanding that I have no ulterior motives. I have no need for fame or power. And I have no need to spread any message beyond what I’m giving away in small doses for free here on So Much More Life. I write about simple, deliberate living because I think it’s the best way, not because there’s a living in it, because I want to be your guru or because I have something that really needs to be said. I’m too simple, perhaps, to find value in ebooks anymore. What about you? UPDATE 8.8.2011: Blogger Robert Wall of Untitled Minimalism has posted a response post called Minimalism & EBooks — The Counterpoint Post. Comments are still open below, and you can also join a discussion of this topic in his comments section too. Hilarious. I wrote a 50 page ebook, and never did anything with it–save send it to the few people who really might enjoy it. This troubled me for a while, but now it doesn’t. The project exists; it would not be a successful ebook because it doesn’t promise El Dorado, and cannot be calcified into a 25-second spiel. Thank you for articulating my ebook-estential angst. It’s time for web writers to re-prioritize our time, energy, attention. I’m sure writing an ebook is an important experience for some writers, but I’m with you: There must be something else that needs or wants doing. Thanks for joining the conversation, Mark. I’ve thought about writing ebooks. I got into blogging through minimalism, though, and so it never felt right to, like you say in the post, sell people something they really don’t need all the while advocating doing away with (more or less) everything. Thanks for this post, consider me a subscriber. It’s good to have you here, Joe. Minimalism is also so easy to explain that an ebook isn’t necessary: Get rid of everything that doesn’t have meaning to you. Then enjoy what you have. That’s the whole message. Excellent. This really did need saying – and I don’t mean you need to excuse your lack of e-books (for which, applause). Thanks for the applause. I expected to hear some new voices in response to this post, and I’m glad to see that happening. Thanks, Marti. I’ll take that to mean you agree. So far, everyone agrees with me — more or less — on this issue. I’m looking forward to seeing some opposing opinions, though. But on the other hand, blogs are often a journey for the person posting the blog (and those of us who comment on them), and maybe offering ebooks doesn’t yet qualify as not necessary. Your blog today reminds me of HC Anderson’s “The Emperor’s New Clothes”. I think your point about blogs being a journey for the writer is absolutely true. I’ve seen people say that, and I thought about that when I wrote this post. As a writer, I just don’t see how something like an ebook could be a journey unless it simply to prove that they are capable of writing a large project or organizing a large amount of material. But people can do anything they want. I just don’t always get it. I’ve always liked the idea of pulling a fast one on the emperor. And I’ve read a few blogs that seem like they’re written by wannabe emperors! Yay for you, no ebook(s)! Have to admit that I’m quite tired of even very interesting bloggers hawking them or a price or for donations. I can see where an ebook might be fun to write or compile, though, but am glad that you have decided (for now, anyway) NOT to do it. It might be fun to write but not to sell. I’m not at all opposed to selling things as a way to make a living but this blog is not about selling. The concept of this blog is opposed to selling people things they don’t need. My position is subject to change, but it’s likely to get even stronger on this issue. Is it possible that the very interesting bloggers get to afford the time to be very interesting by selling a few ebooks? I don’t really see your objection to be honest – just ignore the posts about the ebooks. I don’t think that’s likely. Most bloggers that offer ebooks mention them in almost every post in one way or another — links to sales pages, links at the end of posts, links from key phrases in posts… I used to read one writing blogger who mentioned some product of hers in every posts without fail. I actually congratulated her in the comments of one post for forgetting to include her usual promotion. While there may be some limited use for ebooks, it’s time for serious writers to take a stand against ebooks. They’re clutter. I agree with you on this, Gip. While I’ll admit that I’ve enjoyed reading a few bloggers’ e-books, I find the phenomenon of publishing, promotion, and cross-promotion to be decidedly non-minimalist, sometimes to the point of being tiring. One blogger releases a book, and then a bunch of other blogs feel they must do a post promoting, reviewing, or otherwise discussing it. And a few blogs have their sidebars littered with ads for their own or others’ e-books. One question, though. You did mention that this post was not about the future of publishing or reading formats, but I did notice you consistently wrote “ebooks” but never “books.” Would you feel the same about a blogger writing a book to be released in a printed paper edition? Or perhaps multiple formats? E-books are often written by bloggers because they are inexpensive and easy to self-publish, with virtually no marginal cost. That potentially lowers the quality bar a bit (not that all e-books are bad, nor are all printed books good). Anyway, is your real concern that of writers hawking their wares on their blogs, or do you find ebooks (emphasis on “e”) alone to be superfluous? I really do dislike all those post promoting the same blogger’s ebook and all those sidebar ads. Most bloggers give away their best ideas anyway, so this all just seems silly. Professionally published books are a different story. Any blogger who tries to capitalize on his or her audience is doing it wrong, no matter what the item being promoted. The quality issue is important too. Most ebooks are superfluous, and many print books are. I’d much rather see people releasing their best work to their loyal audiences for free, even when the people are like me and could use some money. Blogs are fresh and live – they are live performances, with all their faults and incomparable energy. Ebooks and printed books are more perfect recordings of past ideas. I’m with you, Gip. I love my (new) Kindle, but it instantly brought the problem of digital clutter. If I’m going to read, its either blogs (via instapaper) or proper books that I’ve been waiting to read for a while. I consider blog reading to be my alternative to magazine reading – lots of short articles and all for free. Only problem with the way I’m reading them is that I rarely go to the computer to make comments. Digital clutter is probably just as big a problem today as brain clutter and physical clutter. I do hope you get to the computer more, though, because blogs thrive on comments. Can you not make them from a Kindle? I’m totally in the dark about e-readers except the ones I’ve seen on display in bookstores. The ones I’ve tried in stores don’t work very well, but I understand Kindle is better. Thank you, thank you, thank you. 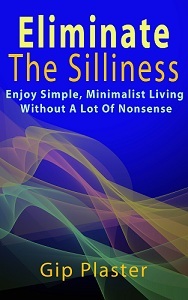 Nothing turns me off on a minimalist/simple living site like seeing “buy my $10 ebook!” Thanks for keeping it real. Thanks for commenting, Joanna. It’s nice to see a comment on an older post. I almost missed it! No ebooks here… ever!